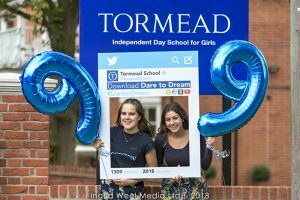 Tormead’s Dare to Dream song was purchased or streamed 9665 times in the first three months after its release into the music charts last September. 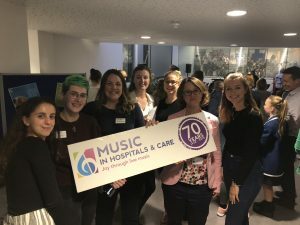 All proceeds from the downloads, approximately £100 so far (calculated to year-end 2018), will go to Music in Hospitals & Care, a charity which brings live music to people in care settings across the UK. 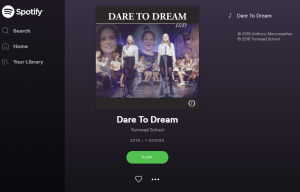 The inspirational song made it to number 99 in the music charts last year, which was a wonderful accolade for our two Dare to Dream vocalists – Poppy in Lower Sixth and Tia in Upper Sixth! 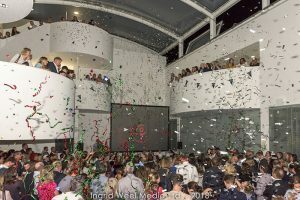 Dare to Dream was launched amidst balloons and fanfare following a count down by Headmistress Christina Foord at the glittering September event. Composed by Director of Music Anthony Merryweather, the song was performed live, delighting guests at the event. Other acts performing on the night were the school’s Symphony Orchestra, Jazz Band, Schola Cantorum, Senior Vocal Group, soloists, poetry readings, drama performances, and special guests – the Boxgrove Primary School choir. View the heart-warming Dare to Dream video here!